Jacob Boehme's Aurora (Morgen Roete im auffgang, 1612) exercised a vast open or underground influence on popular and mystical religion, poetry, and philosophy from Germany to England to Russia. This beautiful and highly original work containing elements of alchemical, esoteric, and anticlerical thought is a portal to the cultural, scientific, and theological currents on the eve of the Thirty Years' War. Its author heralded the new heliocentrism, opposed intolerance and religious conflict, and entertained an ecstatic vision of order reconciled with freedom. This first modern English translation places the translated text opposite an edition of the German manuscript from the author's own hand. 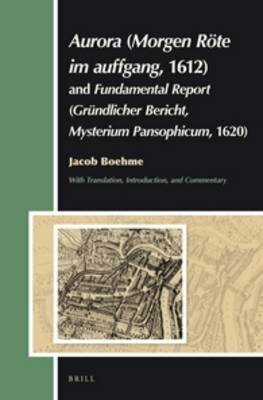 Also included is the brief, influential Fundamental Report (Grundlicher Bericht, 1620) in a critical edition and translation. An extensive commentary that cites documents of the time offers access to the sources of Boehme's themes and concepts. Edition: XII, 823 Pp., Index ed.